The plot begins with ISIS detonating a massive bomb in the Marais district of Paris. Gabriel Allon, the Israeli Mossad Agent poised to become the chief of Israel’s secret intelligence service, is asked by a desperate French government to eliminate the man responsible for the terrible attack. Gabriel and his team get to work and quickly learn that the man behind the attack is a terrorist mastermind who calls himself Saladin. With women all over the world, including the west, joining the ranks of ISIS, Gabriel exploits the terror group’s one weakness by inserting a recruit of his own to infiltrate Saladin’s operation. 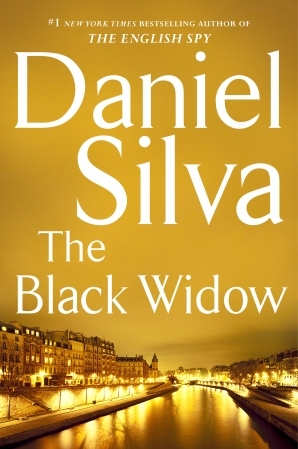 Although Gabriel remains a compelling character in this book it appears Silva is preparing readers for a world where this hero takes on more of a supporting role as a bureaucrat. As one era seems to come to a close another one is beginning. Two members of Allon’s team, Mikhail Abramov and Dina Sarid are poised to play a larger part in future novels, but hopefully so will the newly created character Dr. Natalie Mizrahi. She is a French-born Israeli recruited, trained, and inserted into ISIS to locate the terrorist Saladin. A Jew hiding in the heart of the so-called caliphate, a black widow, she knows that a single misstep will result in her own horrific death. More than that, she knows that failure to complete her mission will result in hundreds more deaths. It is up to Allon and company to eliminate this terrorist threat and prevent the next hideous act. Readers should hope that these three characters take center stage because they are likeable, compelling, and ones that people can root for. As Silva comments in the book’s ending, Jews in France no longer feel safe and free. Unfortunately this novel is not just a fictional thriller, but a believable scenario of events happening today. With a stunningly brilliant plot, a captivating cast of characters, and a story all too real THE BLACK WIDOW is a must read.